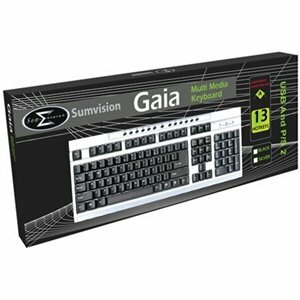 The Sumvision Gaia incorporates perfect curve design featuring multimedia keys providing convenient shortcuts for your windows system. Plugging directly into USB, this keyboard is perfect for the home or at the office providing simple to use plug and play feature. Utilizing laser printed characters creates hard to remove lettering on the keys so that you will always know what your typing without the wear and tear of normal keyboards. Misc Laser printing characters "hard to remove key print"